If you are a Montero Sport owner and have installed or are planning on installing an ARB Bull Bar it is CRITICAL that the factory Mitsubishi bumper mount tabs be reinforced! The Mitsubishi factory bumper mount tabs are welded to the ends of the frame by machine; the automated welder produces a very deep but very narrow weld. 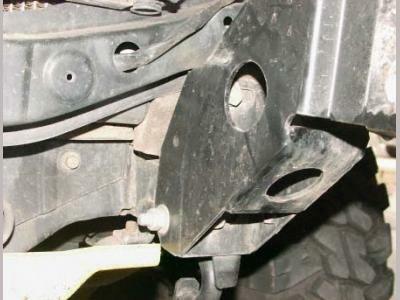 These welds are suitable for attaching the factory bumper mount tabs to the frame members to support the factory bumper but not an ARB Bull Bar, which can weigh in excess of 200 lbs. with an installed Warn XD9000 winch and Hi-Lift jack. 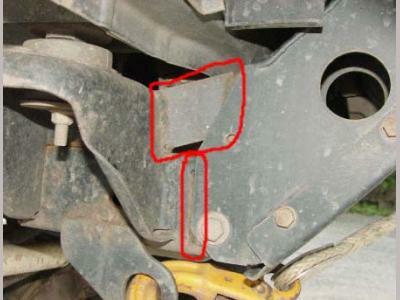 Nor are the welds strong enough to withstand winching forces, or blows to the ARB Bull Bar - i.e. hitting rocks, cars, trees, etc. If the factory bumper mount tabs are not reinforced eventually (it won't take long!) the welds will break and the bumper - while it will NOT come completely off the vehicle, thank God - it will swing (pivot) downward towards the ground on the two large bottom ARB Bull Bar bumper mount bolts (visible in the picture below at the bottom of the ARB Bull Bar bumper mount bracket). It is possible for ARB Bull Bar to then catch on the front tires, debris on the ground, rocks, curbs, etc. Obviously, this would result in a catastrophic accident if the ARB Bull Bar came loose at high speeds. At the very least, the ends of the bumper will pivot upwards and tear up the front fenders and possibly the hood and grill assembly pretty badly. 4x4 Extreme Sports has received calls and emails from at least four people over the last year regarding this problem. In addition to emails and phone calls I had a chance to experience this little issue first hand when the ARB Bull Bar on my 1997 Montero Sport all but fell off in my driveway one Saturday afternoon following a visit to the Holly Cross trail. Two blows to a rock on the waterfall section had broken most of both welds on the driver side and all but half of one weld on the passenger side. While getting ready to leave the next day I noticed the bumper was tilting downward towards the ground. So, I grabbed a hold of the bumper 'hoops' and tried to move it around a little suspecting a loose bolt or two. Imagine my surprise when 180 lbs. of bumper just decided to come right off in my hands. Yippie. At least it was prevented from dropping on my toes by the two large bolts that attach the ARB to the frame. Unfortunately, the resulting 'pivot' of the ARB Bull Bar on those two bolts forced the ends of the bumper into the front fenders and inner skirts bending them up pretty good as well as breaking the front grill. Thankfully I was able to catch the bumper before it swung and tore the winch cables out of the engine bay and off the battery. 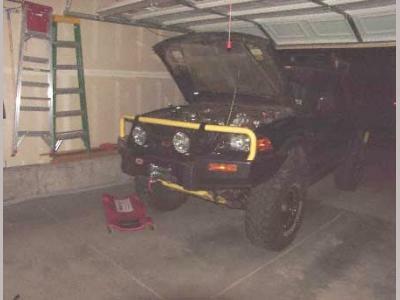 To the right is a picture of an 'emergency' weld to reattach an ARB Bull Bar to a 1998 Montero Sport. You can see above the tie-down ring the L bracket that was welded across the ARB Bull Bar bumper mount bracket to the front body mount bucket. This was an emergency fix and is not the recommended method for resolving this problem. 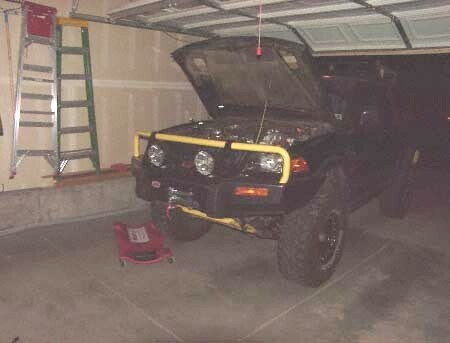 As you can see it is now impossible to remove the ARB Bull Bar bumper mount bracket from the Montero Sport chassis. 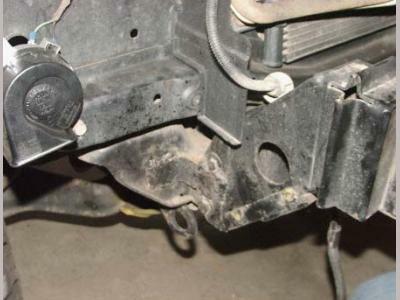 The recommended method for resolving this problem is to completly remove the ARB Bull Bar and the two ARB Bull Bar angled bumper mount brackets from the vehicle. Once this is done the factory bumper mount tabs will be accessible and may then be re-welded and reinforcement braces can be installed. This should be done by a competent, experienced welder familiar with welding vehicle frames. 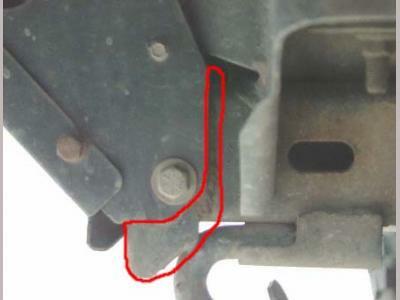 Visible in the picture to the left outlined in red is the factory Mitsubishi bumper mount tab extending out from underneath the ARB Bull Bar bumper mount bracket. 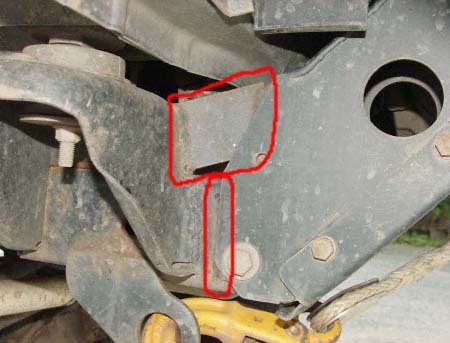 Also visible inside the upper red outline is one of the reinforcing welds attaching the factory bumper mount tab to the frame. Not visible in this picture is the weld on the reverse side attaching the opposite side of the bracket to the inside of the frame rail. 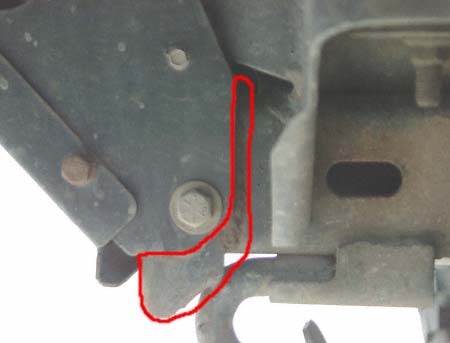 Visible in the picture to the right is the outside reinforcing weld on the factory bumper mount tab (lower red outline) and more importantly the reinforcing brace welded to the top of the factory bumper mount tab (upper red outline). Note that although the visible braces and outer welds appear to be to the ARB Bull Bar bumper mount brackets, they are not. The complete ARB Bull Bar bumper assembly is still removable and if need be the factory bumper could still be easily reinstalled.